Today I would like to talk about the beautiful region of Puglia, the heel of Italy’s “boot”. Puglia is a region rich in history and beauty. From the archeological ancient lands of Magna Graecia to Leporano and the Muscettola Castle, surrounded by some of the most stunning beaches on the Ionian coast. Lecce, another gem of the Puglia region, is the Baroque masterpiece of Sothern Italy, or, as it’s sometimes described, the Florence of the South. 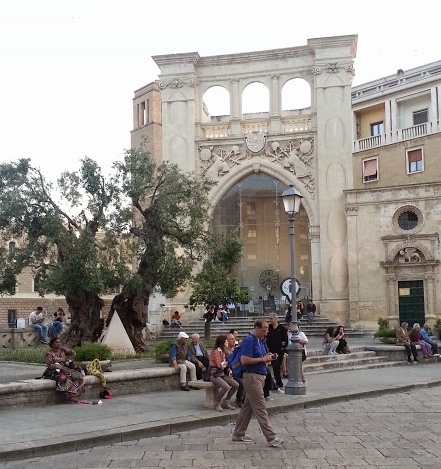 Lecce’s history goes as way back to the days of the Roman Empire. Ruins of a Roman theatre and amphitheatre are still visible to this day. However, it was the 17th century when Lecce truly prospered. It was when the highly ornate and extravagant Baroque style came to life in the construction of grand churches and palaces. Puglia is known for many things: trulli, orecchiette pasta and its glorious Ionian coast. However, nothing is more Puglia than the 60 million olives trees that blanket the region. The sheer volume of trees is something to be amazed at, yet, it is the century old trees, called ulivi secolari, which will blow you away. Their robust, knotted and twisted trunks have truly been shaped by a mix of time, sun and man’s hand. Tasting food in Puglia is also a unique experience. Food is like a religion to its people. Each small village has its own typical recipes and dishes rich in fragrances, with menus based on homemade orecchiette, grilled meats and fish-based specialties. There are also seasonable vegetables, dairy products, cheeses and many baked goods: focaccia, fried pettole and sweet pasticciotti. It’s easy to enjoy the slow pace of life in the in Puglia. From visiting its agricultural museums, it’s whitewashed hill towns, century’s old farmland and hundreds of kilometres of Mediterranean coastline. However, you can’t stop in Puglia without tasting its regional wine. Negroamaro, Aleatico and Primitivo to name a few. Puglia is a region you truly enjoy with all your senses.